If you’re in the ecommerce game, you’ve likely more than once wished your cart abandonment rate wasn’t so high. On average, cart abandonment hovers around 70%, with variations for different industries. That’s a pretty big number! It’s also one that’s almost always needlessly high. Most ecommerce stores can significantly reduce cart abandonment with a few simple tweaks to their checkout process, boosting overall conversions in the process. One of the biggest contributors to a needlessly high abandonment rate is poor checkout design. In fact, ecommerce studies show that “long and complicated” checkout processes are the third biggest contributor to abandonment during checkout. 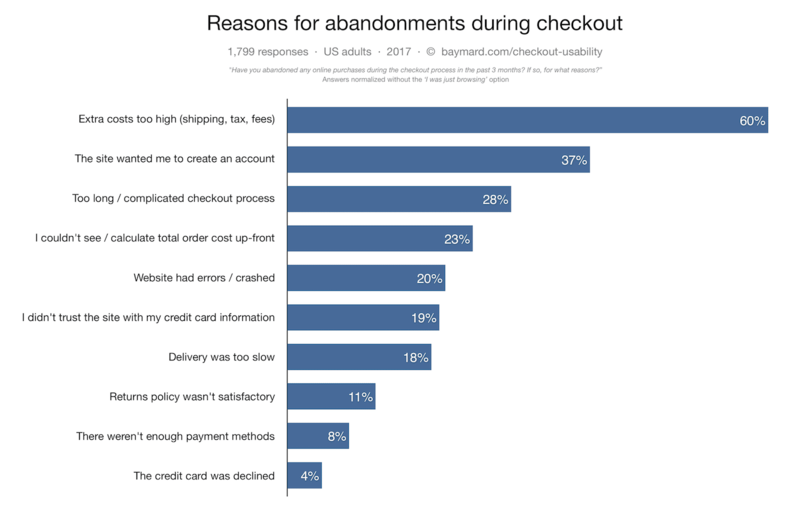 “Too long/complicated checkout process” was the third most common reason of checkout abandonment. The second most common was “The site wanted me to create an account”. Source. So what’s an online retailer to do? In this guide, we’re going to look at 23 checkout optimization tips with which you can improve the ease and effectiveness of your checkout pages. We will learn how to reduce and avoid checkout abandonment. In fact, what you’re about to learn has been not once responsible for a 200% increase in sales. 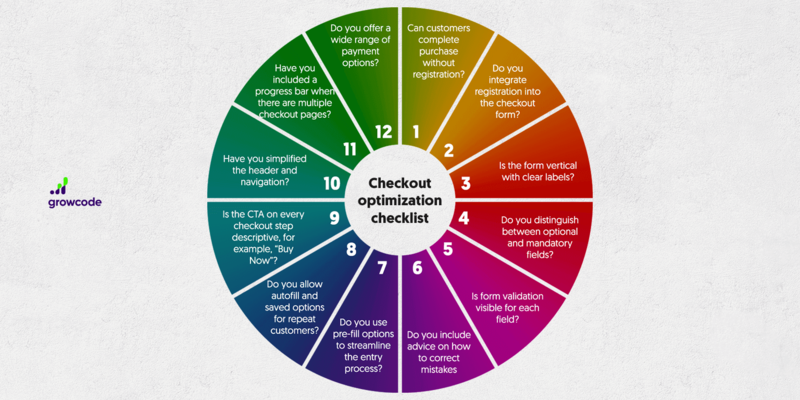 Let’s dig in into this checkout optimization guide. But before reading this article find out the top 4 reasons why users abandon shopping carts in the episode of Bite-size Ecommerce Optimization. Can your customers complete their purchase without registration? 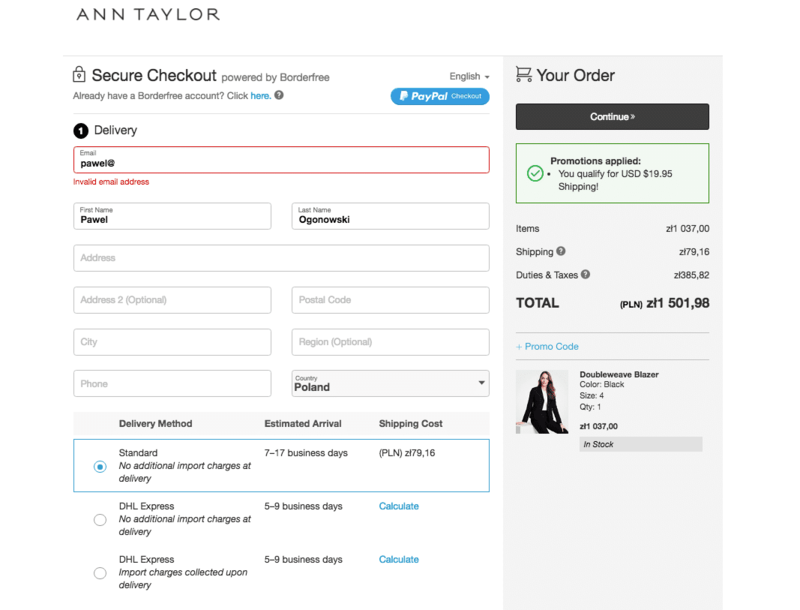 For first-time customers, do you integrate registration into the checkout form? Do you ask for customer emails at the beginning of the checkout process so that you can follow them up if they don’t complete an order? Is the form vertical (linear) with clear labels that don’t disappear when a user fills them out? Are there any fields you can get rid of to shorten the checkout form? Do field sizes match the expected size of the input? Do you distinguish between optional and mandatory fields? Is form validation visible for each field? Do customers know immediately if they have incorrectly filled a form? Do you include advice about how to correct mistakes beneath fields when inputs are incorrect? Do you use pre-fill options to streamline the entry process? Do you allow autofill and saved options (such as credit cards) for repeat customers? Do you “encapsulate” credit card entry fields differently to other forms to create a layer of perceived security? Do you include visual prompts for credit card details, such as an image of where to find the CVV code? 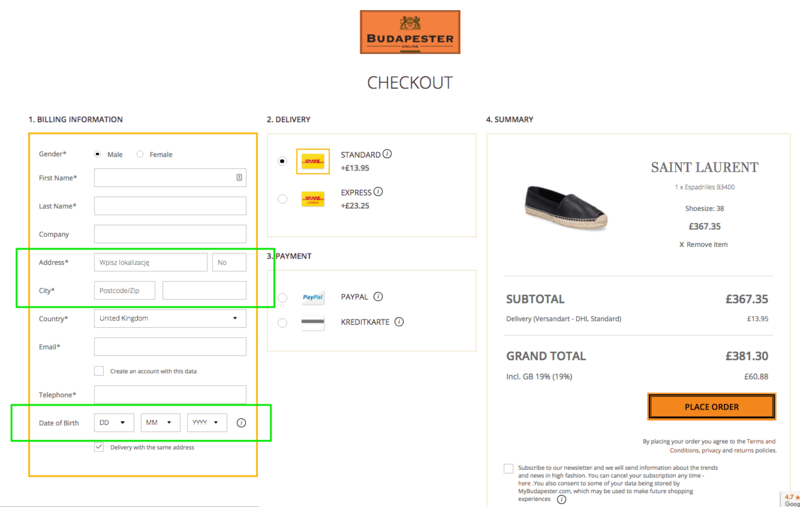 Is the label of the main CTA on every checkout step descriptive, for example, “Buy Now” or “Complete Purchase”? Is the main CTA clearly visible and does it stand out from other secondary CTAs? During registration, do you overcomplicate the password selection process by including unnecessary requirements? Have you simplified the header and navigation? 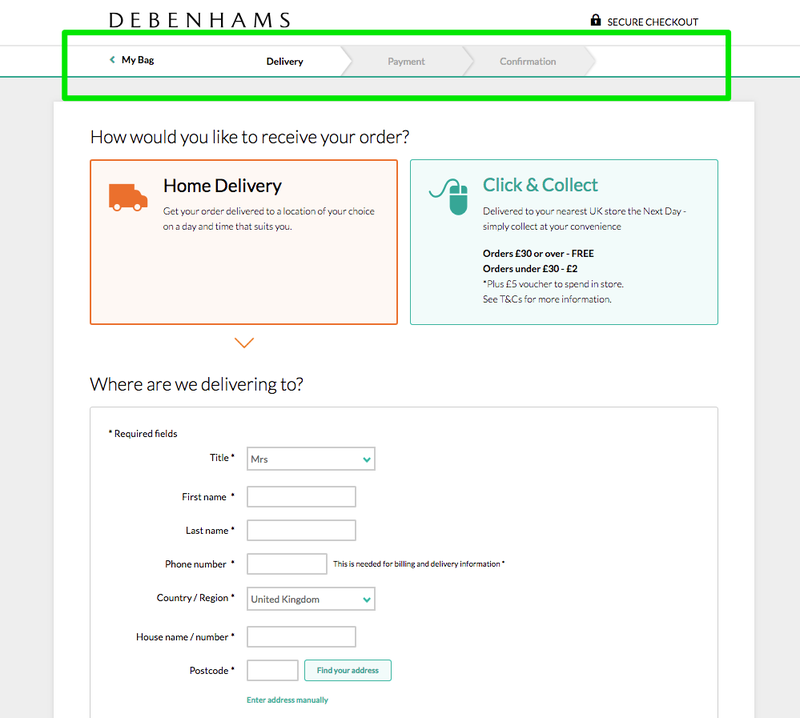 Have you simplified the footer to prevent customers accidentally clicking away from the checkout process? Have you included a progress bar when there are multiple checkout steps? Is it absolutely clear that your order summary page, immediately prior to purchase, is not a thank-you page? Can users make changes to their address on an order summary page (immediately before purchase) without having to go back to the start of the checkout process? Do you offer a wide range of payment options? 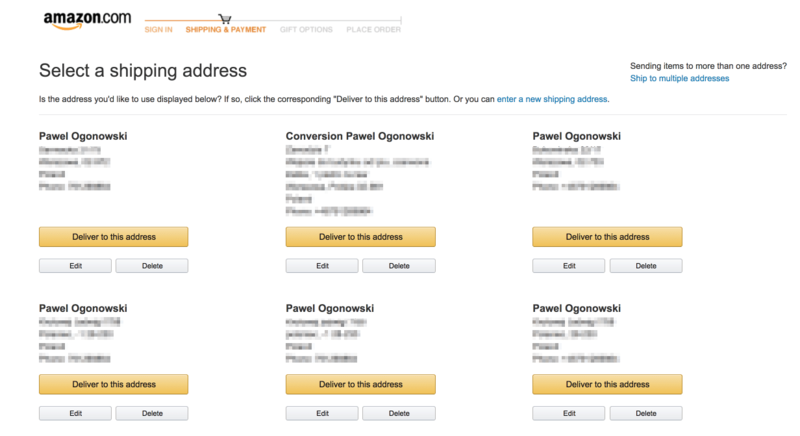 Do you offer ultra-streamlined checkout options, similar to Amazon One-Click? 1. Can your customers complete their purchase without registration? Mandatory signup is the single biggest contributor to cart abandonment during checkout. Always offer the option to check out as a guest, while allowing those customers that wish to sign up (or already have accounts) to easily do so. 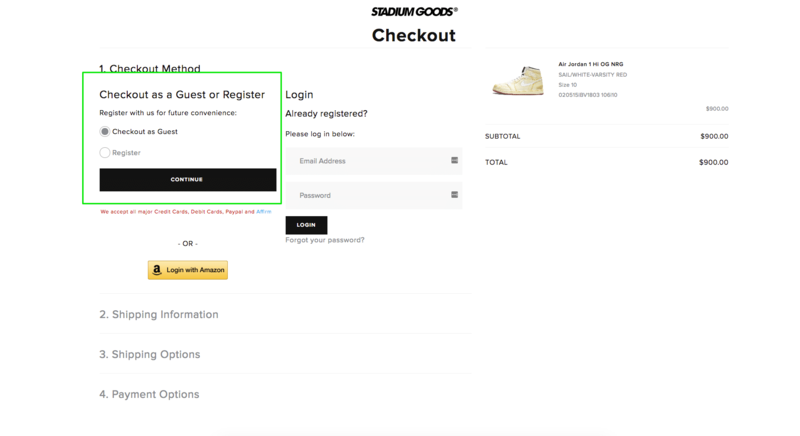 Stadium Goods offers the option for users to check out as a guest or to register, thus appealing both to customers that don’t want to sign up and those that do. 2. 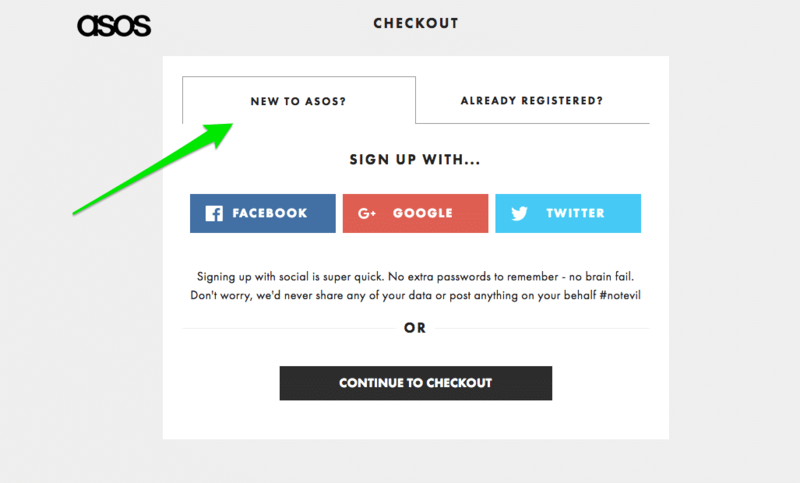 For first-time customers, do you integrate registration into the checkout form? Do you make registration part of the checkout process rather than require separate inputs? If you don’t, you’re likely sacrificing both sales and new account signups. ASOS offer one-click, seamless sign-up. They don’t ask for an extra set of inputs. 3. Do you ask for customer emails at the beginning of the checkout process so that you can follow them up if they don’t complete an order? 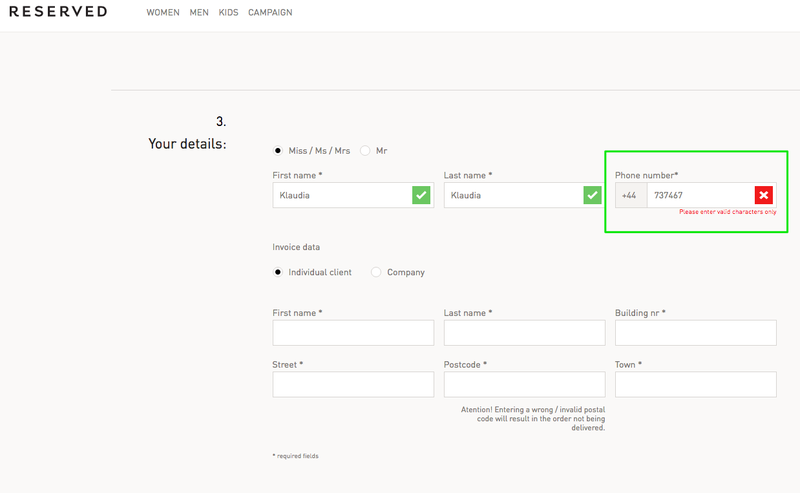 While it’s not usually advisable to add extra stages during checkout, requesting emails can give you an opportunity to get in touch with customers if they don’t complete a purchase. Debenhams only ask for the email. No extra information is required. 4. Is the form vertical (linear) with clear labels that don’t disappear when a user fills them out? Often, customers will need to go back to verify information. Using static or floating labels (that don’t vanish after a customer enters their information) can help streamline this process. 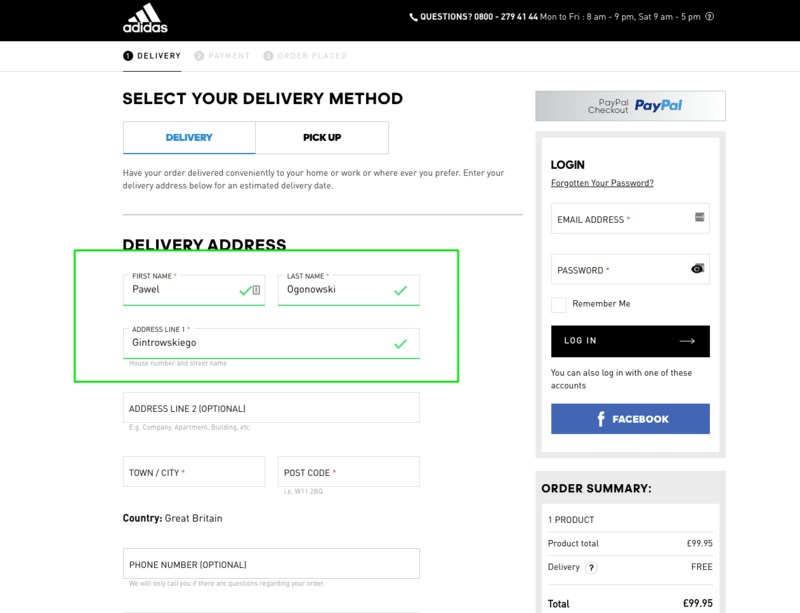 Adidas make use of floating labels (that are minimized above the text box) so that customers can keep track of the information they’ve entered. 5. Are there any fields you can get rid of to shorten the checkout form? Superfluous labels add to the effort needed to complete checkout. Reduce friction by getting rid of them. Do you really need your customers’ mobile numbers? What about their middle names? It is especially important to remember about this point during mobile checkout forms optimization. 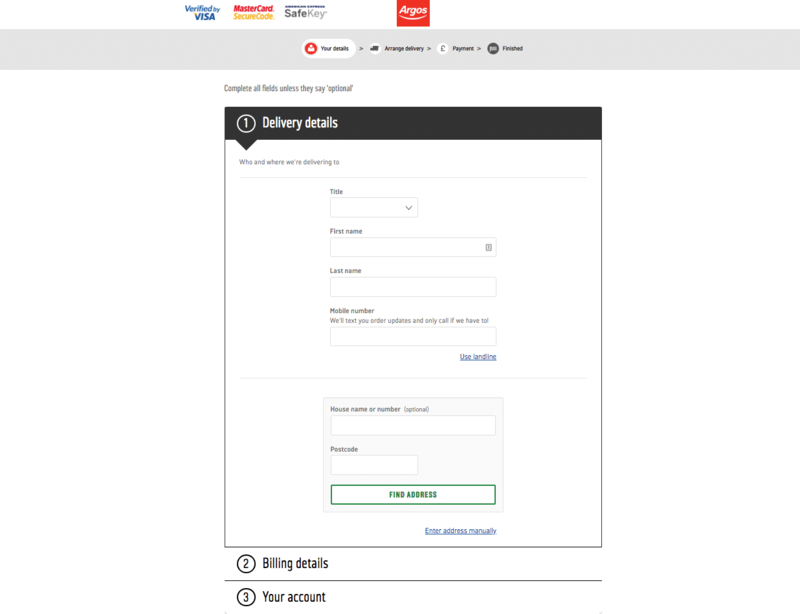 Argos presents a simple and clean checkout form. They do not require any unnecessary information from the user (maybe except for the “title”. 6. Do field sizes match the expected size of the input? 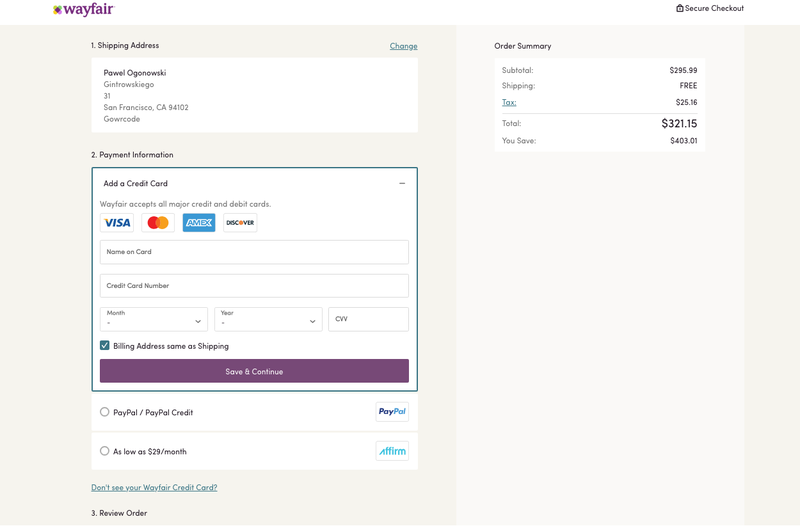 Minimizing fields that require a short input will streamline checkout by indicating that minimal effort is required. Similarly, making sure that longer entries have wider fields will enable customers to quickly double-check their inputs. Minimize fields where only short information is required. 7. Do you distinguish between optional and mandatory fields? If you don’t want to get rid of optional fields entirely, indicate that information is not mandatory. Staples clearly show required fields on their checkout form with an asterisk (*) and include “(optional)” next to those that aren’t. 8. Is form validation visible for each field? Do customers know immediately if they have incorrectly filled a form? If customers have incorrectly entered information, let them know as soon as they move onto the next field. Repeatedly having to submit form information is incredibly frustrating. Let you customers know immediately if they have made a mistake. Repeatedly having to submit form information is incredibly frustrating. 9. Do you include advice about how to correct mistakes beneath fields when inputs are incorrect? If a customer has incorrectly entered information, it’s possible that they’re unsure what is expected of them. Remedy this problem by including prompts and advice. RESERVED provides additional information for uncertain customers. 10. Do you use pre-fill options to streamline the entry process? Do your forms take advantage of pre-fill options? For example, will a full address auto-populate fields based on a zip code? 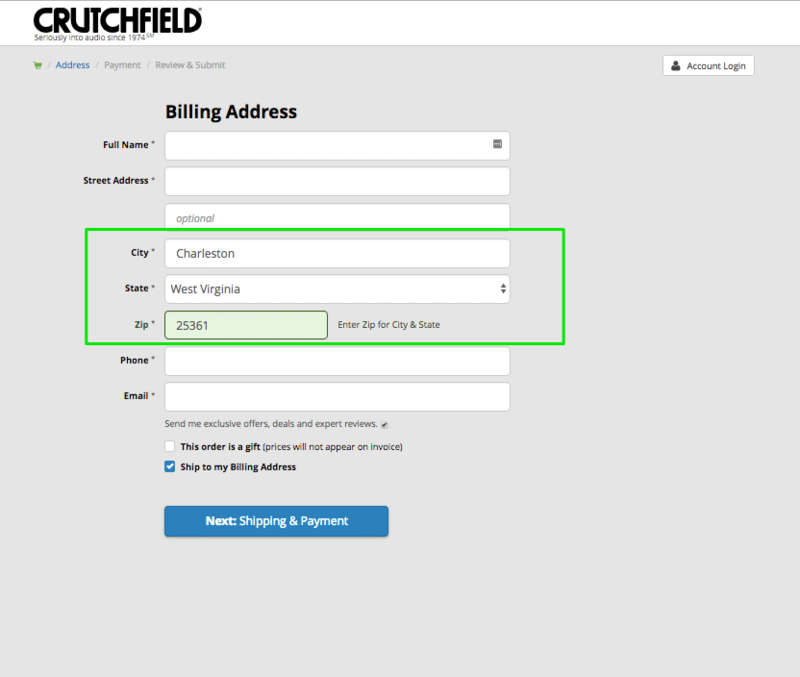 The Crutchfield form above automatically generates part of an address based on a customer’s Zip Code (it would only be wiser to ask for the zip code earlier!). 11. Do you allow autofill and saved options (such as credit cards) for repeat customers? If customers have accounts with you, are you letting them take advantage of saved details, like addresses, credit card information and even shipping options? 12. Do you “encapsulate” credit card entry fields differently to other forms to create a layer of perceived security? Are forms for payment information designed differently and located in a separate area, on or on a different page, to create a perception of increased security? Forms for payment information are designed differently, put in a frame to create a perception of increased security. 13. Do you include visual prompts for credit card details, such as an image of where to find the CVV code? Customers may not know how to find certain pieces of information, or what a term like “security number” means. Overcome this problem by including small visual cues. 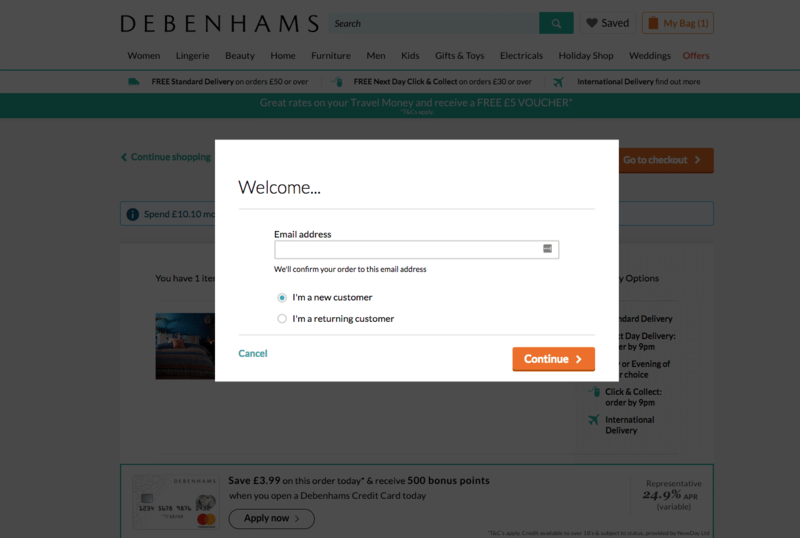 Debenhams includes a picture showing customers where to find their security number next to the appropriate entry field. 14. 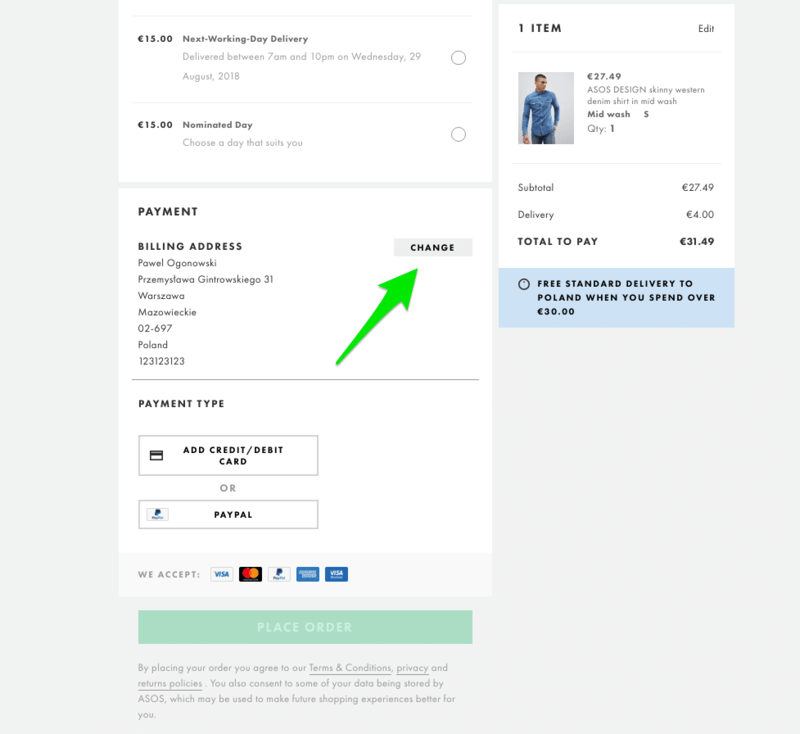 Is the label of the main CTA on every checkout step descriptive, for example, “Buy Now” or “Complete Purchase”? Don’t use the word “Next”. It’s uninspiring and implies further steps. Excellent use of “Complete order” CTA. 15. Is the main CTA clearly visible and does it stand out from other secondary CTAs? Always ensure that your CTA is in a contrasting color and large enough to be seen. On mobile devices, a screen-width button (that can be tapped with either hand) is optimal. Primary CTAs should always be more prominent than secondary CTAs. 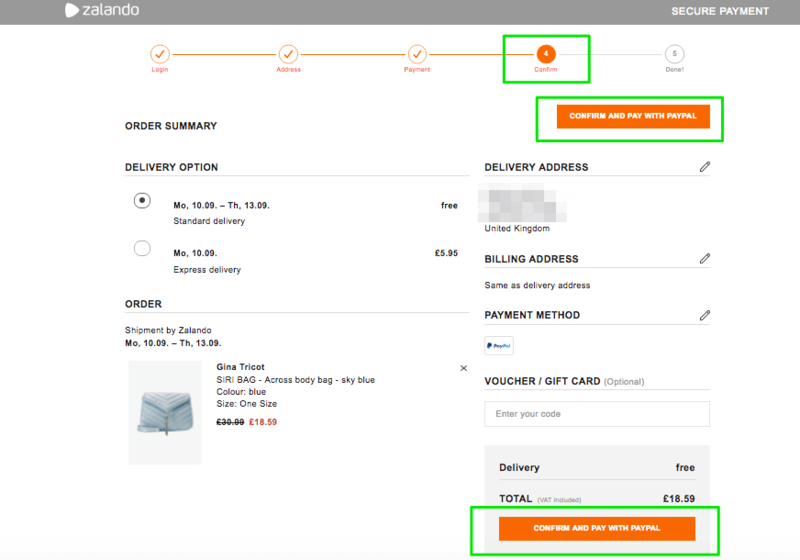 While completing the purchase in Zalando, users are not distracted by other secondary CTA. They are sure what is the next step of the process. 16. During registration, do you overcomplicate the password selection process by including unnecessary requirements? Don’t stipulate that passwords have to be complex unless it’s absolutely necessary. Consider including a password auto-generation option. Don’t stipulate that passwords have to be complex unless it’s absolutely necessary. And is it here really necessary to include 8 characters and numbers? 17. Have you simplified the header and navigation? During the checkout process, you want customers to complete one action. Any on-page elements that move them away from the main form have the potential to add to your abandonment rate. Minimize header distractions and links away from the checkout page. Minimize header distractions and links away from the checkout page. You want your customers to complete the purchase and not to be disctracted. 18. 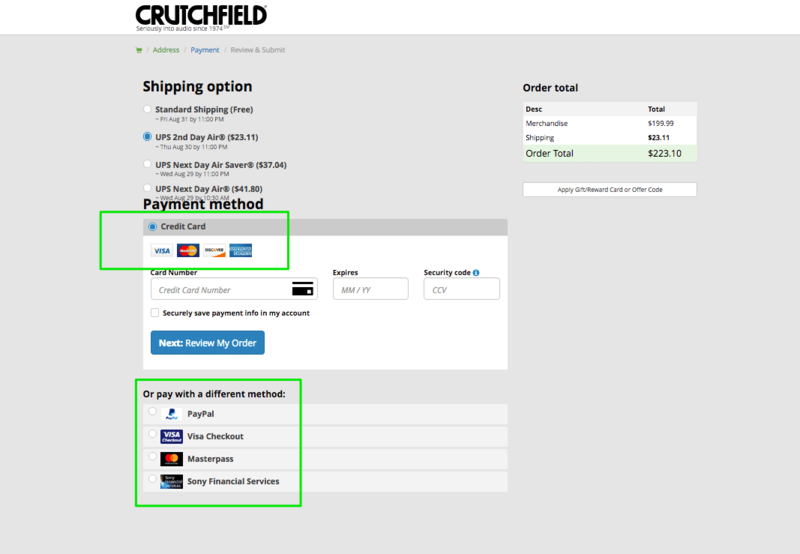 Have you simplified the footer to prevent customers accidentally clicking away from the checkout process? Following on from the point above, you should also simplify your footer to ensure that customers’ attention isn’t drawn away or they accidentally click another button. 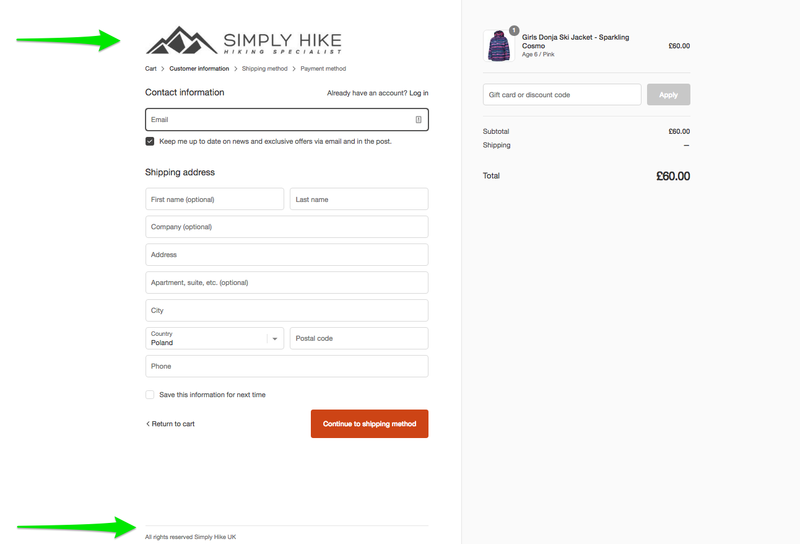 Simply Hike has minimized both footer and header getting rid of all the unnecessary information. 19. Have you included a progress bar when there are multiple checkout steps? If there are multiple pages involved in your checkout process, let customers know how far they have to go to completion. 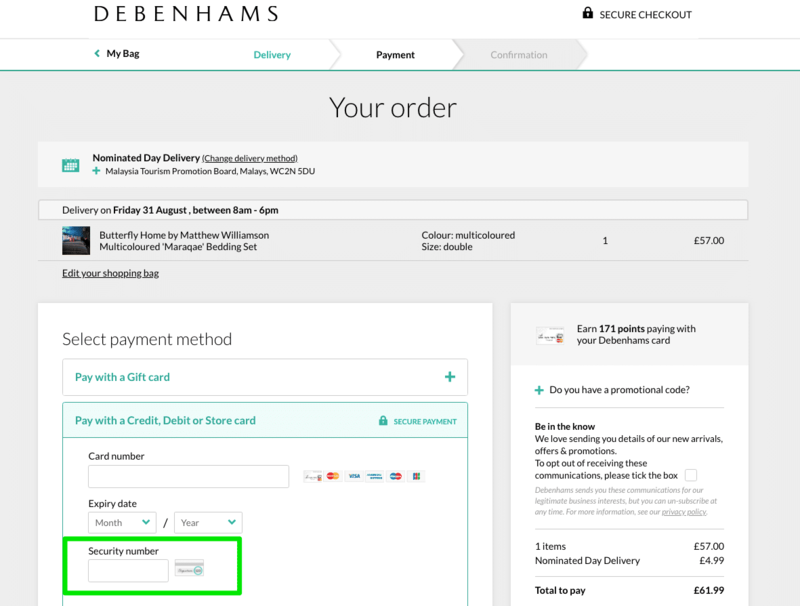 Customers are more likely to finish checkout with Debenhams because they know they only have a limited number of steps to complete. 20. Is it absolutely clear that your order summary page, immediately prior to purchase, is not a thank-you page? 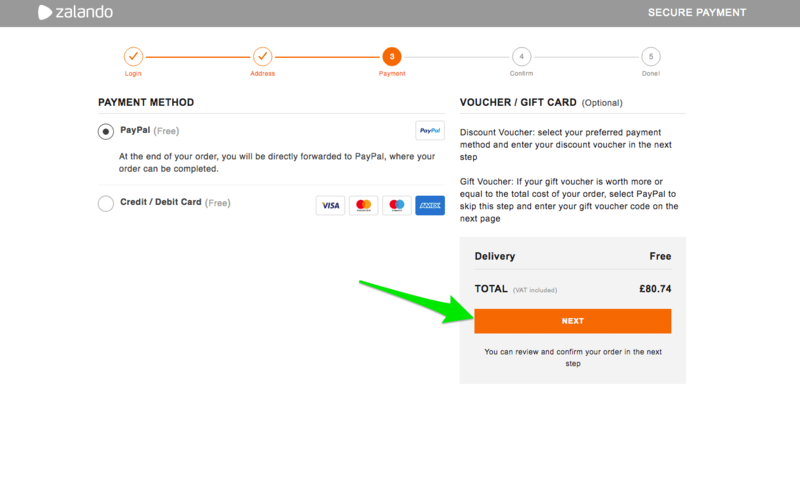 Is your order summary or confirmation page, where customers review their purchases before adding payment details or confirming, misleading in any way? In particular, is it clear that it’s not a thank-you page? While shopping in Zalando customers are sure that they need to do one step more to confirm transaction. It is clear that this is not a thank-you page. 21. Can users make changes to their address on an order summary page (immediately before purchase) without having to go back to the start of the checkout process? If customers have entered incorrect information, are they able to change it from the order summary or confirmation page without having to go back to previous pages? Including an option to change will reduce friction at this crucial stage. 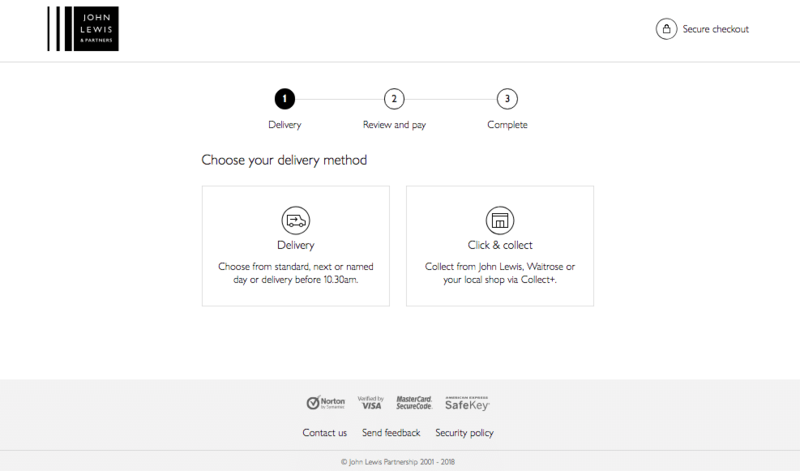 ASOS allow customers to change their billing address from the order confirmation page. 22. Do you offer a wide range of payment options? Cast the net as widely as possible with payment options, allowing customers to check out with their preferred choice. What’s more, including multiple payment options will create a perception of greater security. Crutchfield offers a number of card options AND methods. 23. Do you offer ultra-streamlined checkout options, similar to Amazon One-Click? Amazon’s conversion rate is uniquely high for a reason. 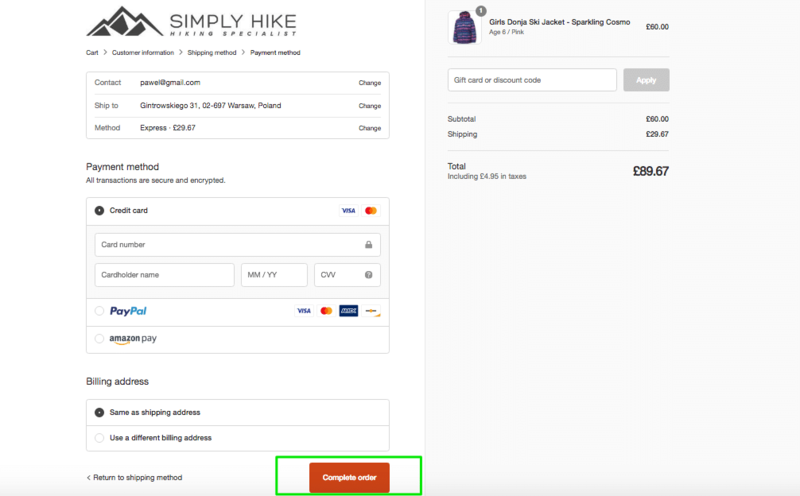 If possible, offer customers the option to checkout with only one or two clicks. It’s the very definition of a frictionless purchase! Amazon offers customers the option to checkout with only one or two clicks. Curbing high cart abandonment is only one of many steps in ecommerce conversion optimization! Achieving the best possible ecommerce conversion rate for your online store requires a holistic approach to optimization. You need to pay attention to all your pages, from the homepage to the “About Us”. And your checkout process is one of the most fundamental parts of this mix. As the checklist above has hopefully shown you, there’s no great complexity to reducing cart abandonment at this key stage. It’s all about small but vital tweaks that reduce friction, build trust and overcome hesitancy. The most important 12 points from the 23-point optimization checklist. Now, time to get your developer on the phone! High unexpected costs – There’s nothing worse for a customer than seeing a host of extra costs when they finally come to check out. The simplest way to solve this problem is to offer free shipping. If you do have additional costs (like taxes, fees, charitable donations etc. ), show them up-front on the product page. If shipping is based on customers’ zip codes, then let them enter it for a price. When you tell your users that they will get free delivery on the product page and in the shopping cart, there won’t be any room for surprises. Compulsory account creation – Don’t force customers to open an online account. The best checkout method is usually to redirect shoppers from the cart straight to the shipping address form. Always offer the option to check out as a guest. The simplest way is to redirect users from the shopping cart straight into the shipping address form. Complex and long checkout process – The average online checkout process is 5.4 steps long. It sounds obvious, but customers don’t like spending a long time checking out, so make it as simple, distraction-free, and short as possible. There are no distractors on the page and the user can focus on the single most important goal: placing an order. Security concerns – Building trust during checkout is very important, especially when users are providing you with credit card information. But how do you do it? First, get SSL encryption for your site. Second, show logos of credit card companies. And third, enable users to pay with trusted methods like PayPal or Visa Checkout. Building trust in the checkout is utterly important – especially when users are about to provide you with their credit card information. Implement all these tips and I guarantee that your sales will grow by 30% or more! 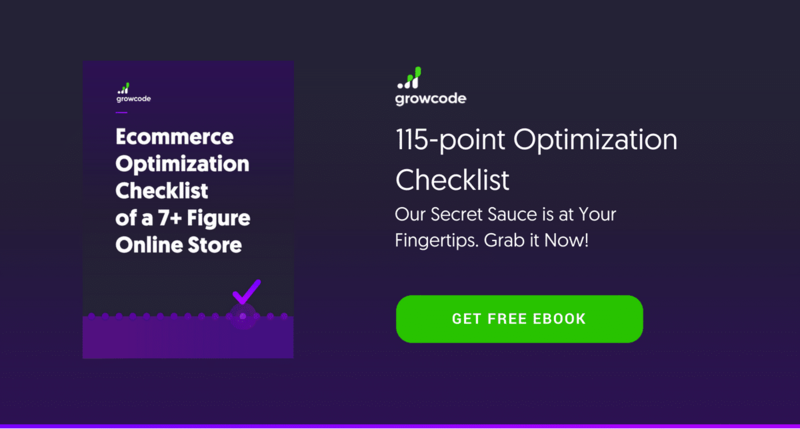 In our exhaustive ecommerce optimization checklist, we’ve covered everything you need to know about optimizing your online store.